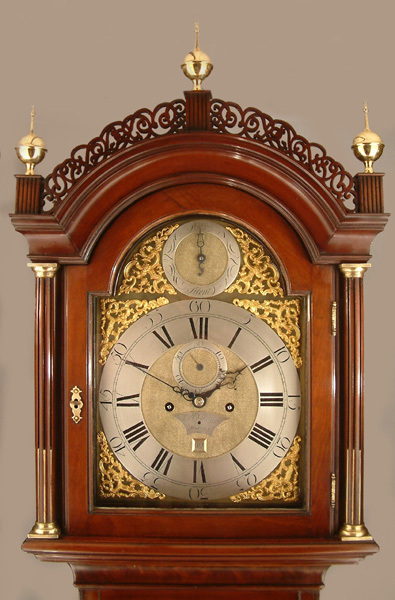 William Mason Longcase Mahogany Circa 1780 - Height 92in. This Longcase Mahogany's Maker - William Mason. Several of this name recorded late 18C in the Southwark and Dockhead districts of London. Typical late 18C high quality "London" flame/figured mahogany case with pierced and fretted cresting, long door and typical two step base. 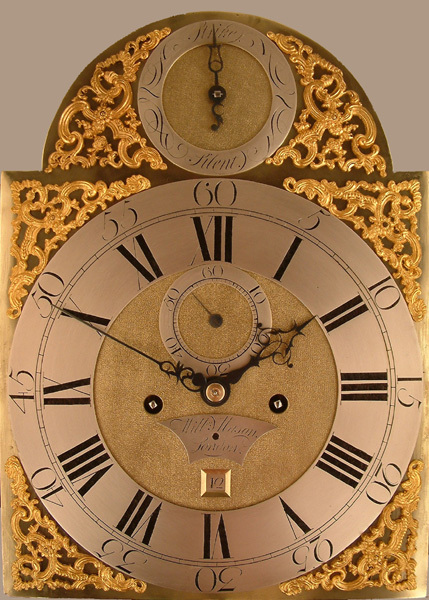 12" breakarch brass dial with strike/silent to arch, matted dial centre, subsidiary seconds dial, date aperture and blued cut steel hands. High quality 5 pillar movement with hourly ( rack ) striking. William Mason. Several of this name recorded late 18C in the Southwark and Dockhead districts of London. 92" ( 234 cms. ) or 87.4" ( 222.5 cms ) ex finials.